Blog Home > Bathrooms and Shower Rooms > When is a ladder not a ladder……. When is a ladder not a ladder……. 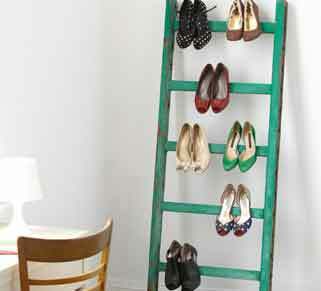 We’ve found some great ideas on the web for up-cycling an old ladder via scraphacker.com. 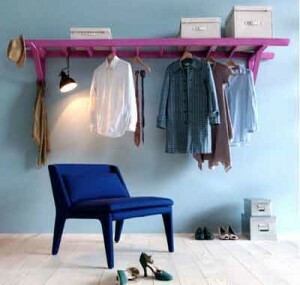 They can be left to just lean against a wall, used as shelving or suspended from ceilings. Take a look and be inspired! In the picture above an old ladder had been cut down and painted a bright colour. Wooden brackets have been painted to match. The effect is very funky and modern. If you were using this in a guest bedroom you could put the ladder and brackets on hinges so the whole thing would fold flat against the wall when it wasn’t in use. 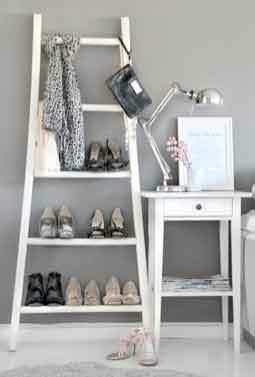 Or you could turn a wooden ladder into a shoe rack! If you are short of storage space for all your lovely shoes, a lick of paint will turn the front of an old stepladder into a great shoe rack. Stepladders have a tread to put the shoes on rather than just having round rungs, so they are ideal for this sort of DIY project. Also, it doesn’t matter to you if the ladders are broken. However if you want someone’s old ‘throw away’ ladders make sure you get their permission to salvage them before you re-home them! To find out how to secure the ladders you can go to our fixings section for advice on which screws and wall plugs to use for which type of wall you have. High-heeled shoes will hang off the rungs of a traditional ladder like the one pictured below. The inspiration for the colour came from a favourite pair of emerald green shoes. You can also use a ladder as a towel rail in the bathroom or as a hanging rack in the kitchen. There are so many possibilities…. The good thing about using old items to create something new in your home is that they come with character already built in to the materials you are using. Old wood gets a smoothness to the grain and may come with attractive worn sections. Even chips, scuffs and some old woodworm holes can look great in old wood set off in ultra modern settings as well as in old cottages. If you like this distressed effect then you might prefer to simply wax or varnish the wood rather than painting it. If you use yacht varnish it will be very hardwearing, and it will also withstand the humid conditions you find in kitchens and bathrooms. Just be sure that if you are going to use an old wooden ladder than has been left in a shed for years that you check it is strong and sound. Also if there are signs of woodworm then it is worth treating it before you turn it into your next interior design project. Treating wood with boron to cure woodworm infestation is a relatively simple process, and boron is a much less smelly and toxic process than some other woodworm treatments. Find out how to use Boron to cure woodworm in our projects section of the main website. For more wood treatment products and tools visit DIY Doctors DIY Superstore.